Man, I love the Bay Area. With a side of pancakes, of course. But seriously—our lives seem to shifting out of wine country and into the Bay Area more and more, and even though I love Sonoma County, Marin County is quickly becoming one of my favorite places. For the past couple weekends, I’ve been helping Adam move to his new pad closer to the city (and by “helping” I mean hanging his clothes while he and the guys carry in boxes) but in our down-time, we’ve gotten to do a little exploring in the area. And by exploring, I mean eating. Duh. So far, one of our favorite places around town is Cibo, a little coffee shop that carries the “famous” Blue Bottle Coffee (if you’re from San Francisco you know what I’m talking about) as well as a variety of baked goods, yummy panini and salads. Well, we went the other morning and I had the special: cornmeal pancakes with a fried egg and fruit. The pancakes were deliciously dense, a little on the grainy side and unlike any pancake I’ve ever had. In the best way possible. I knew I had to recreate the recipe at home…stat. If you’re a fan of thick, hearty pancakes you’ll love these! I was full after eating only one and that never happens. Trust me. I made a quick and easy strawberry sauce to top my pancakes with….and ended up eating the majority of it with a spoon straight out of the pot. I used the extra strawberry sauce to make strawberry margaritas. Because what goes better with pancakes than margaritas?!? If you said a bloody mary with bacon in it, you’re probably right. But I had to work within my means. And my means usually involves tequila. I wrapped leftover pancakes in tin foil and stuck them in the fridge….and voila! A gourmet breakfast was ready in thirty seconds the next morning. You could also try freezing them between pieces of wax paper and reheating in the toaster oven. Because of the cornmeal, these guys are a little heartier than normal buttermilk pancakes and thus, hold up better. Try spreading them with peanut butter and strawberry sauce..it will blow your mind. 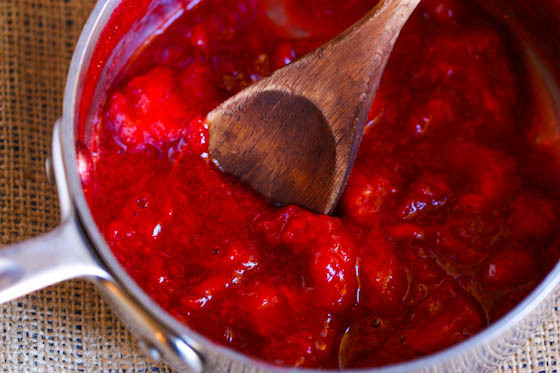 Combine the strawberries, sugar and vanilla in a small saucepot over low heat. Cook the strawberry mixture for about 20 minutes, until it’s juicy and jam-like. At this point, most of the strawberries will have broken down. Remove from heat and set aside while you make the pancakes. Beat the eggs in a large bowl. Add the buttermilk and oil and beat until well blended. In another bowl, combine the flour, sugar, cornmeal, lemon zest, baking powder, baking soda and salt. Whisk together well then add dry ingredients to wet ingredients and mix only until just combined. Melt butter on a hot skillet then cook pancakes for about 30 seconds each side. Be careful—they brown quickly! Top pancakes with strawberry sauce and serve. the combination of flavors and textures in these pancakes sound amazing! I’m book marking this recipe and definitely will be trying them out!!! I adore thick, hearty, dense pancakes and love cornmeal, so I know that I’m going to get on just fine with these pancakes. The strawberry sauce is a beautiful pop of color to these, too. I can’t wait to try these. I love pancakes with a good texture to them! I need to try making my own. I love pancakes and waffles (I eat the Natures Path brand regularly). What I like most is that you can have them along with any meal or any snack. And the additions are plenty: fruit, eggs, yogurt, nut butter, maple syrup, honey (great), butter, milk, etc. Adding flax and seeds or coconut oil is good too. Breakfast this weekend?? Check! Your recipes never cease to amaze my wife and I! Exploring a new place through food is the only/best way! Love the strawberry sauce. These look fantastic! 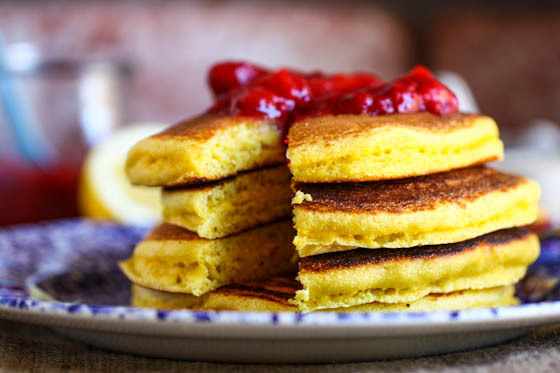 I love cornmeal pancakes because of their hearty texture. Oh my gosh – that is a phenomenal idea!! I have a cupcake recipe like this and I never thought to translate it to pancakes but YUM! I am REALLY tempted to make a cross country move to California– a temptation probably informed largely by the life you lead there! we have pancakes almost every week for dinner and these will be great to add to the rotation. they look amazing! 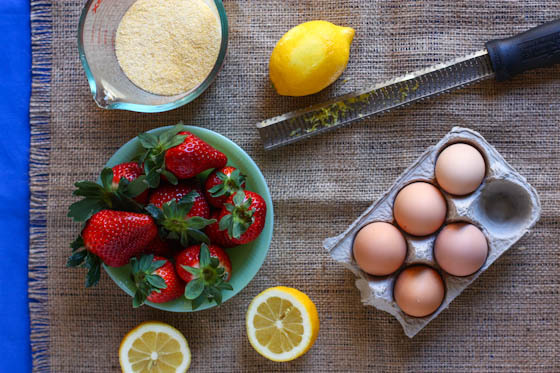 The pancakes look phenomenal; the lemon and strawberry – both the flavor contrast and color contrast…beautiful! It was because of Marin County about 10 years ago that I moved to CA! I went to visit a friend in San Rafael, fell in love with Marin Co. and told my husband we WERE moving to CA. We ended up in San Diego about a year later, not Marin, b/c ultimately I am a warmer-weather girl, but I love it up there…so much. There is just so much to offer and it’s so beautiful!! These look delicious. I love how YELLOW they are! And it’s the perfect recipe for using up cornmeal after making cornbread–I always have extra. I love recipes that make me step back and think-like this one! Cornmeal…. Margaritas and pancakes. Sounds like a breakfast for dinner kind of meal if I’ve ever heard one! These look dense, beautiful and like they’d fill you up and keep you going through the day! Being from the South, I have a HUGE soft spot for anything cornmeal! Good to know they freeze well, because I’m not certain my Austin friends share the same affection. Lemon and strawberry are such a nice combination! p.s. These pancakes look amazing! Strawberries and lemons are beautiful together. I’ve never had cornmeal pancakes, but just by reading the recipe list and looking at the pictures, they look wonderful! Also, can’t beat that strawberry topping. PS my fave pancake right now is your sweet potato one with chocolate chips. Thanks for sharing that! Jenna, I love spreading my pancakes or waffles with peanut butter and then fruit! Everyone has thought me wonky for doing this….thank you for reassuring me that I’m not crazy!!! 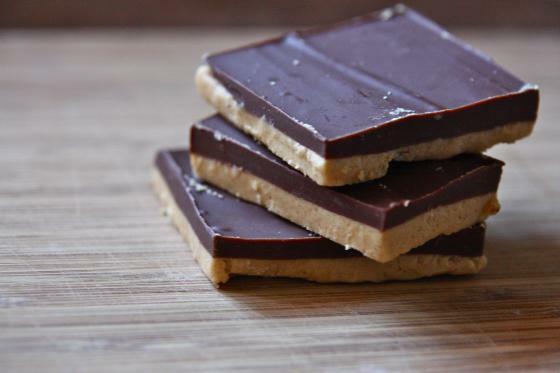 Love this recipe…I simply must try this! these pancakes look amazing! as does that beautiful sunrise. I adooooore San Fran and the Bay Area, and am trying to convince my boyfriend we should move up to Nor Cal (where he’s from) asap. DC has yet to get a sunrise AS pretty as that photo.. I grew up on buttermilk pancakes, I am loving the idea of a cornmeal pancake. They look amazing, plus I’m a sucker for adding fruit to anything! That strawberry sauce is where it’s at! They’re so cheap right now, I want to pour it over everything! OMG I’m dying here. I need to make these immediately! Yum! These look utterly beautiful – such vibrant colours and I know they would taste incredible too. Gorgeous gorgeous post. Love these gorgeous colors together!! Sounds so delicious!! These are absolutely beautiful!!! What an amazing breakfast. The combination of flavors sounds yummy!! 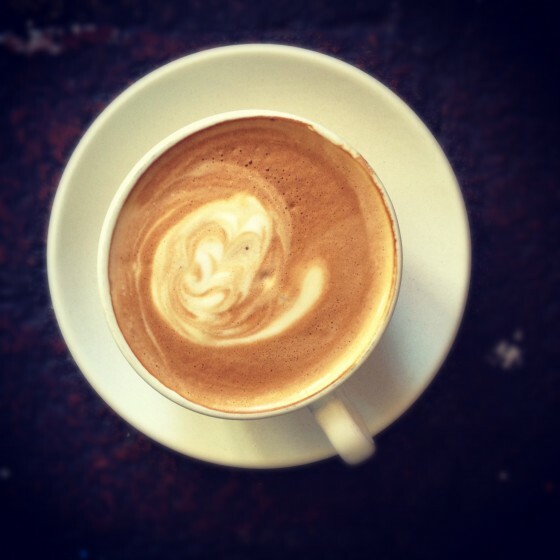 Abosolutely Love Blue Bottle Coffee…I saw the latte and knew where you got it. I live in Michigan but my little sister lives in the East Bay (Walnut Creek) and everytime I visit her I spend way too much money on lattes from Blue Bottle. 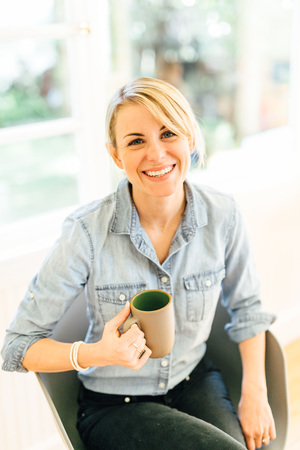 🙂 Love your blog Jenna! I adore cornmeal in all baked goods. I love a little sprinkle on top of pancakes! I’ve got to try these though! Isn’t Marin heaven? The first time I went, I didn’t want to leave. Have you crossed over into Mill Valley to go to Tyler Florence’s store? I highly recommend! No I haven’t! I love him though. Like, really. My dream is to live in San Fran someday. I love South Carolina, but I think I really should have been born on the West coast. What a morning to wake up to…and to have these pancakes. Win/win! Ooh, now these sound really great. I love all things cornmeal but I don’t cook or bake with it as much as I would like. I’m always looking for good cornbread recipes and I have tried arepas a few times here and there, but this looks like a nice happy medium! yum!!! these pancakes are lovely! wouldn’t they be nice with poppy seeds also? Oooh cornmeal in pancakes… I’ll have to get on top of that! We make pancakes from scratch every Saturday morning. I usually use coconut flour or buckwheat flour for mine and a multigrain flour for my husbands. I’m a big, big fan of cornmeal anything though (especially cornbread!). And leftover pancakes are HIGHLY underrated. My cousin and her hubby have lived in SF for years- within spitting distance to Golden Gate Park. She’s the educational director at the Aquarium by the Bay, so it’s great location for her. Her hubby works across the bridge in Marin County, and they’re trying to make their way out there, especially since they have 1 kid and 1 on the way! It is SO beautiful there- but seriously I’d take that or Sonoma and be perfectly happy (I’m stuck on that other coast). Make sure you stop at Fred’s in Sausalito for the pancakes there…probably my favorite in the world! I’ve been having some serious pancake cravings, so I’m definitely trying these out this weekend! I never would have thought of using cornmeal for pancakes. I do love me some corn bread so I can imagine these being just as good. Is Cibo in SF? I thought the only one was in Sausalito. Nope, you’re right! It’s in Sausalito. Yay, spend more time in SF. Can you have a meet up with your readers sometime? 🙂 Also, you should definitely go to Ella’s for brunch in SF sometime. They have amazing breakfasts and wonderful biscuits. It’s in Laurel Heights. Or go to Nopa for brunch. Trust! Yes! I need to plan something again for Bay Area readers. Definitely this Spring! No, but my boyfriend went there the other night and said it was good! He said it was a little overpriced, but the food was really tasty. We went to Pizzeria Rosetti last night and it was absolutely amazing! I’d highly recommend it. Ill have to ask her about that pizza joint. We always go to Pizza Antica in Mill Valley when we’re there. Wow. This checks all my boxes. Lemon and strawberries are as good as it gets. Oh myyyyyyy…. I can not wait to try these! Holy moly these sound too good to be true. 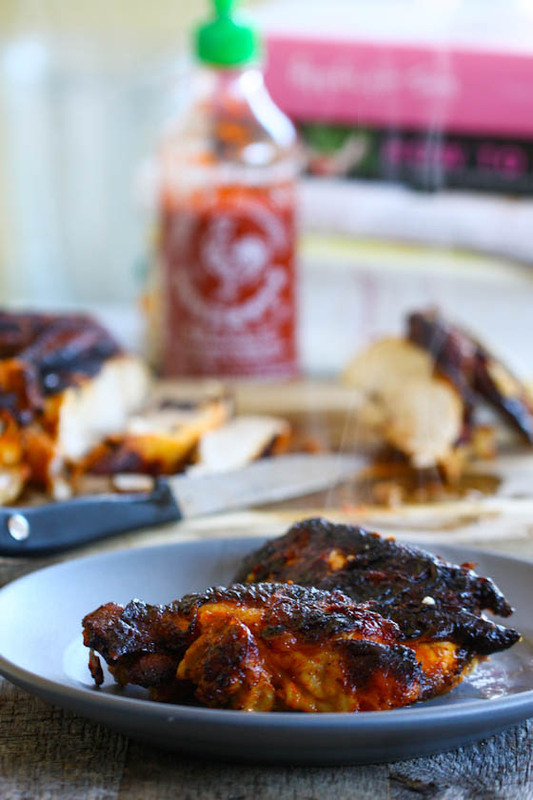 Such an amazing combination of flavors and textures – I want some right now! And unlike a lot of my other fave pancake recipes, which are decidedly seasonal, I could see myself lovin on these all.year.long. Well done! Can’t wait to make them. I am jealous of you and the Bay Area! I’ve never been there but it just look gorgeous…as do these pancakes! 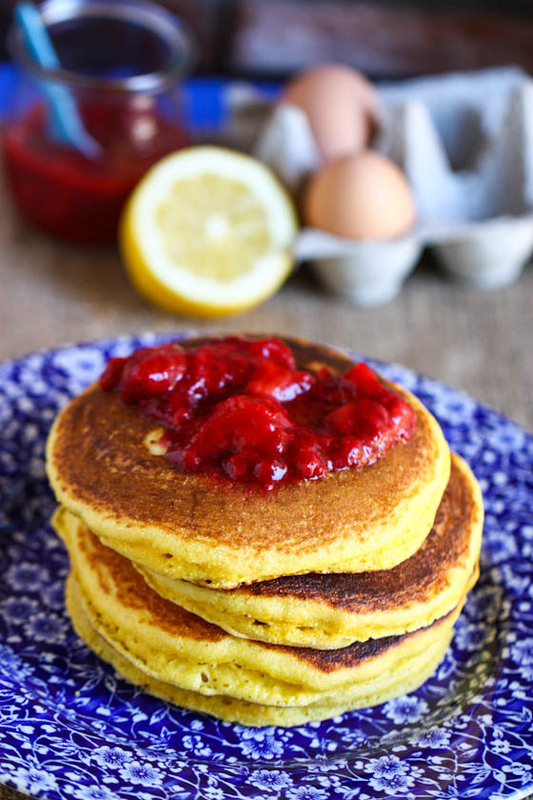 I love cornmeal anything…add them to pancakes and I am definitely game. These look amazing! Totally gorgeous colors – these pancakes look absolutely delicious! Oh.my.goodness. I can’t wait to try these! Those look sooooo good ~ and your photos are fantastic. Great work! Yay for white chicken chili! Now I want some. And I’ve been trying to go to Cheeseboard for years…but somehow it’s never worked out! I need to make that happen soon. Thanks for the yummy recipe! I second your reader recos for other Sausalito soft spots: Fred’s (deep fried french toast. that’s right.) and FISH. Both are just a few blocks north of Cibo. Welcome to the neighborhood! Thank you! Good to know—I haven’t been to either of those spots but have heard through the grapevine that Fred’s is the place to be! These look so fantastic – thank you for sharing! And as always, I love your pics! I love cornmeal. I love cornbread with strawberry jam, so I imagine that this would indeed rock my world. And they just look so pretty, too! I actually have a couple of requests for recommendations . . . my husband and I are planning to rent a convertible (so. excited. this is my favorite part of the plan to date) and do a little wine-country-to-Malibu-ish road trip this summer. I will be mining your webpage liberally for tips otherwise. 1. Any hotel recommendations for San Francisco? We will be spending probably three nights there . . . some place boutique-y, somewhat splurge-y (not millionaire splurge-y, but, y’know, *somewhat* splurge-y)? 2. Any yoga teacher recommendations for SF or north up through Napa/Sonoma? Any suggestions would be most appreciated. Thanks!! Hotel recommendations in San Francisco…hmm…Hotel Palomar is nice! The W is also nice (has killer views!) but isn’t small. As for yoga, I definitely recommend my studio in Santa Rosa! It’s called Three Dog Yoga and we do power vinyasa flow. The teachers are truly wonderful and it’s a great workout. Thanks so much for your reply — always better to be armed with an insider’s perspective, and yours in particular, as I already enjoy your ‘blog a ton. I’m also from a power vinyasa yoga background. I’m definitely making a point to investigate all of these suggestions! These look amazing! I’ll have to make these a day late for National Pancake Day! My brain is going crazy thinking about how I could make these savory and smother them in your shrimp etoufee. These sound so good, and I love the colors, just gorgeous! We have Blue Bottle here in Brooklyn and it’s intense. People line up for nearly 30 minutes on the weekend there. But they do also have insane s’mores there. So I guess it’s worth it. I am definitely going to try these! AH! I was JUST in Marin 2 days ago – my dad is from San Rafael & my uncle lives in their old house. 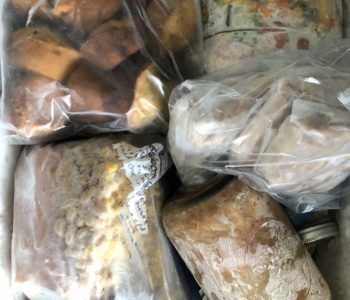 I’m moving to East Bay in a week – bring on the food recommendations! I’m so with you on the cornmeal pancakes – I had blue cornmeal pancakes in Maine once and I still dream about them. Totally normal. I love the Bay Area too…my best friend just moved there and she’s always telling me about all kinds of crazy, fun shenanginas she witnesses or takes part in in San Francisco. Slash, I went hiking last week in Big Sur and was AMAZED by how awesome the weather was! Hiking is nearly impossible in Washington during the winter, unless you want to lug around some snow shoes. Anyway, those pancakes look delicious! I’m pretty sure yesterday was National Pancake Day! HOW did you know I was craving strawberries like mad? These pancakes look so yummy! I’m a Bay Area native and work in the financial district in S.F. so I definitely second the idea of having a meetup of you and your readers sometime. Can’t wait to meet in person! These are absolutely gorgeous! There is nothing like good pancakes and you wouldn’t think they would be so hard to find but BOY are they hard to find! Must give yours a try! Love the idea of cornmeal in pancakes, I don’t think I have ever tried them. The strawberry sauce sounds like the perfect topping. Those pancakes really sound delicious balanced with the strawberry sauce. I’ll have to try these. BTW, SF is my favorite city in the world! Your pancakes are gorgeous – the color of the sunrise! I would love to wake up to a beautiful sunrise like that! These pancakes sound amazing. The strawberry and lemon combination sound delicious! Move me to the Bay Area now! If you get the chance to stop in San Rafael, you HAVE to go to Sol Food! Great Puerto Rican food, but be warned there is almost always a line. The ponche is a must- half mango iced tea and lemonade. I’ve lived in Santa Rosa and now live and work in Marin and I have to agree! 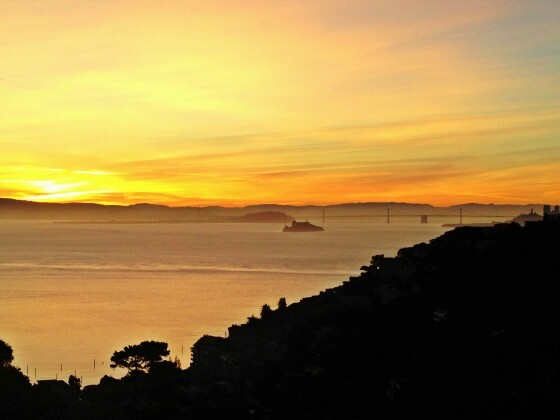 I love how close Marin is to the city (not to mention…Mt. Tam/the beach/everything good life has to offer). I’ve never explored Sausalito before but I may have to just to get my hands on some Blue Bottle Coffee! So good. Ugh…I’m drooling! I’ve never had anything like this but can imagine they are like johnny cakes that I adore! I haven’t been to Cibo yet but love how charming the area is…although I’m out in Napa area and love the rolling hills and farm land just as much as the city. Oh…and …bloody Marry with Bacon–Check out Boon Fly Cafe!! Buttermilk pancakes bore me. But these? Right up my alley! Cornmeal is a great addition to sweeter items and anything with strawberries on top has my vote! Can you post a recepie for crab cakes? That’s a really great idea! I’ll work on it. Love your pictures! Who doesn’t love homemade pancakes (any time of day)? Great post. Those look so good!! I will definitely be making these in the near future!! I love Blue Bottle Coffee….it inspired me to make chemex coffee at home…no more coffee maker machine for us, it’s amazing! I LOVE SAN FRAN…enjoy every bit eating there! Yay! I just bought cornmeal so I can try these soon. I’m picky on pancakes- I only like them if they are made by me-not at restaurants because they are too soft and mushy. I always top my pancakes with chopped strawberries mixed with sugar. I’ve made a strawberry pie with the same strawberry sauce you made. Is cornmeal essentially the same thing as corn grits/polenta? Because I recently inherited a 25 pound bag of corn grits/polenta, and if I can use them for this recipe then I am 100% sure I’m going to make these! You inherited a 25 lb bag?! That’s serious business. Unfortunately, it’s not the same thing! Grits and polenta are much more coarse than cornmeal and your pancakes will be way too dense if you use them. Sorry about that! 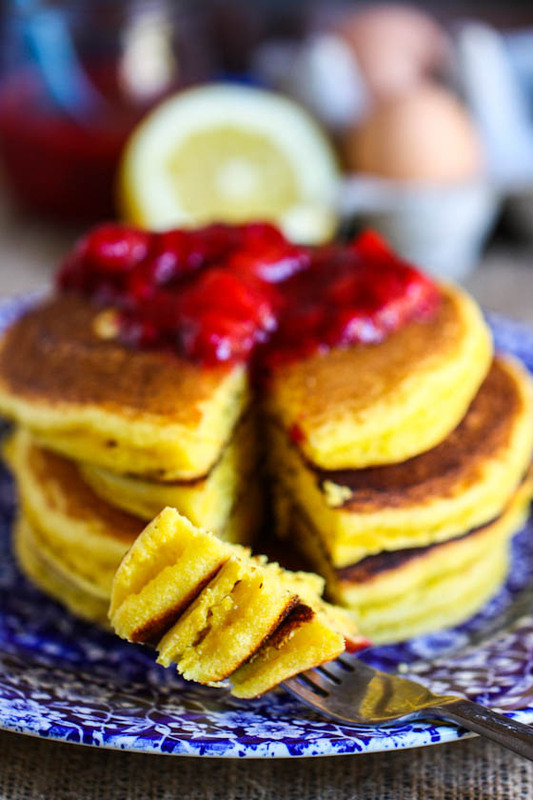 I’ve never tried cornmeal in pancakes, but yours made my “to try” list! Made these this morning and love them! I didnt do the strawberries tho since they’re so expensive right now. I love mine with PB as well! Just made these!!! So good.. had to make some substitutions but still amazing. Topped with greek yogurt. YUM! Thank you!!! 1. just made these for breakfast with cranberry jam instead and wow, wow, wow. 2. i am now a pancake believer. May I just ask what is in that mug? It looks soo good. Great to go along with the pancakes. 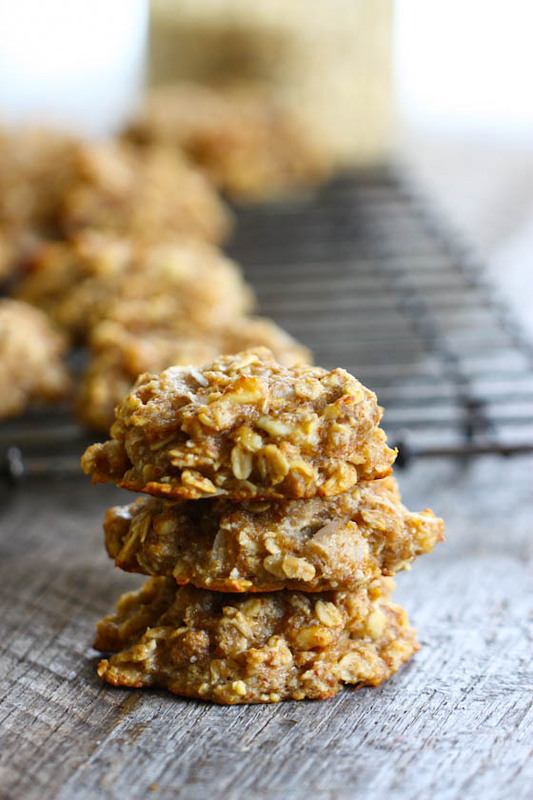 Made these this morning and they were light, fluffy with a bit of crunch. I would have liked a bit more lemon flavor so I think I would add a bit more zest and a splash of lemon juice. I spread a bit of lemon curd on them and then used the strawberry sauce. I would have to triple the sauce recipe because it wasn’t enough for the amount of pancakes or maybe we just really liked it. I pinned a picture of mine on Pinterest and gave this website as the source. This will be a regular dish in my house now. Thanks. Very good pancakes I didn’t use or make the strawberry sauce maybe next time also I just used skim milk they turned out great with a subtle lemon flavor even my picky 4 yo ate them and liked them. Great recipe. Hello and thankyou for this great recipe – I’ve only just discovered your blog! It is great as it is, but the first time I wanted to make it we had no cornmeal in the house so I used an equal quantity of oatmeal ground up in the food processor. Also delicious! great flavor combinations. My batter was a bit runny so ended up with thin-not-cakey pancakes as I had hoped but otherwise a great recipe!